I have had several friends contact me recently with requests for Minced. Some have suggested that I post on quick weeknight meals for the hurried professional. Others, have asked that I offer some healthier options. And one friend, living in Bolivia, asked for a recipe that utilized basic ingredients, but had some excitement to it. While it is hard to imagine one dish fitting all of these requests, I will say that the cooking technique of en papillote may have something for everyone. 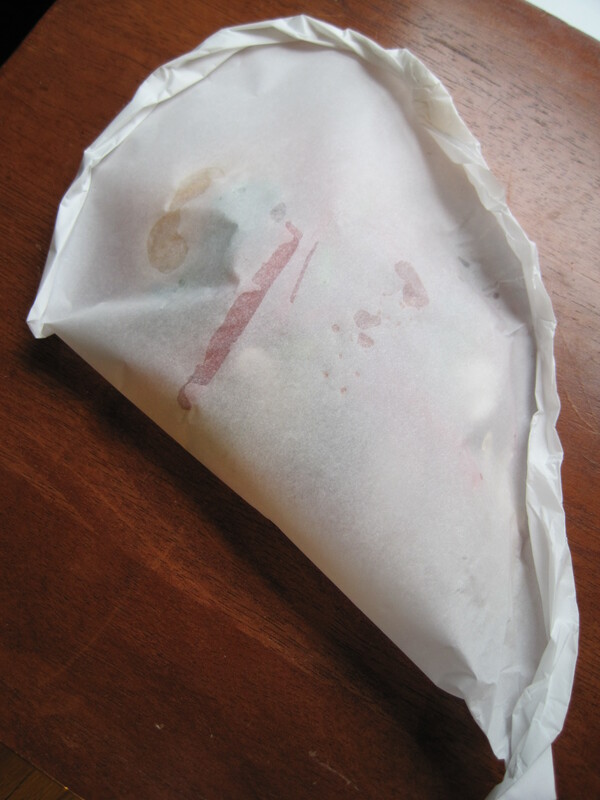 En papillote is a cooking technique that involves steaming foods inside a parchment paper envelope. The technique became popular as a way of preparing Pompano in high-end Florida restaurants. It became more mainstream as people realized the health benefits of cooking in this way. Simply put, the envelope prevents the steam from escaping which means the food being cooked doesn’t lose any of its juices or flavor. And it doesn’t need a lot of fat (if any) – although it can certainly be added for all your diehards out there! What can you cook using this technique? Options are limitless, but I’ve had success with vegetables, shrimp, fish, and chicken. In fact the best thing about this cooking method, other than the ridiculously easy clean-up, is that you can improvise a meal using whatever is on hand; which makes it perfect for those nights when you can’t get to the grocery store (or if you happen to live in Bolivia). The recipe I’m featuring this week boasts Asian flavors. 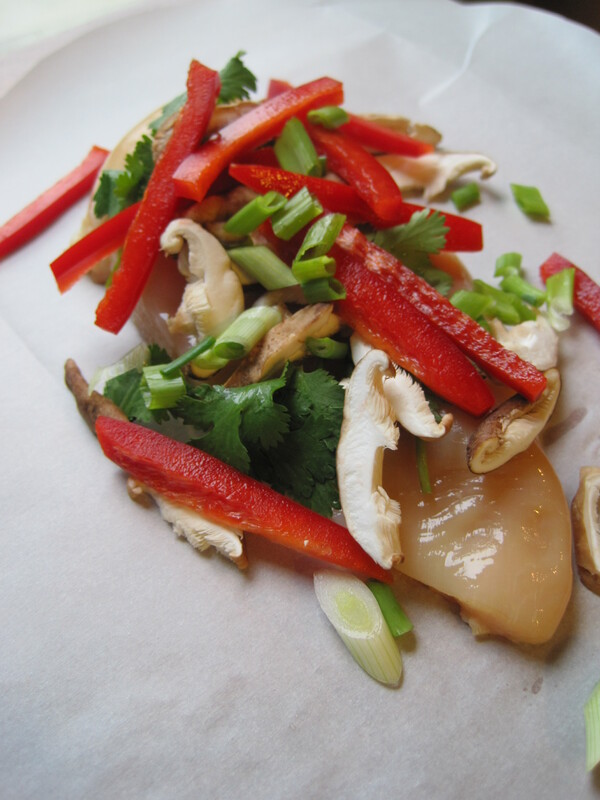 You pile strips of red pepper, mushrooms, cilantro, and green onions on top of a chicken breast; sprinkle a little soy sauce and pepper over the ingredients; then package everything up and bake the envelope for 20 minutes. To be fair, it won’t be the most beautiful chicken breast you’ve ever eaten – although it may well be the juiciest. And if, like me, you are a skeptic when it comes to eating a boneless, skinless chicken breast (oh – the boredom! ), you might be surprised by its flavor. When I sat down to eat and pierced the envelope, the aroma made me so excited to dig in that I actually forgot to take a final picture – a first for Minced. 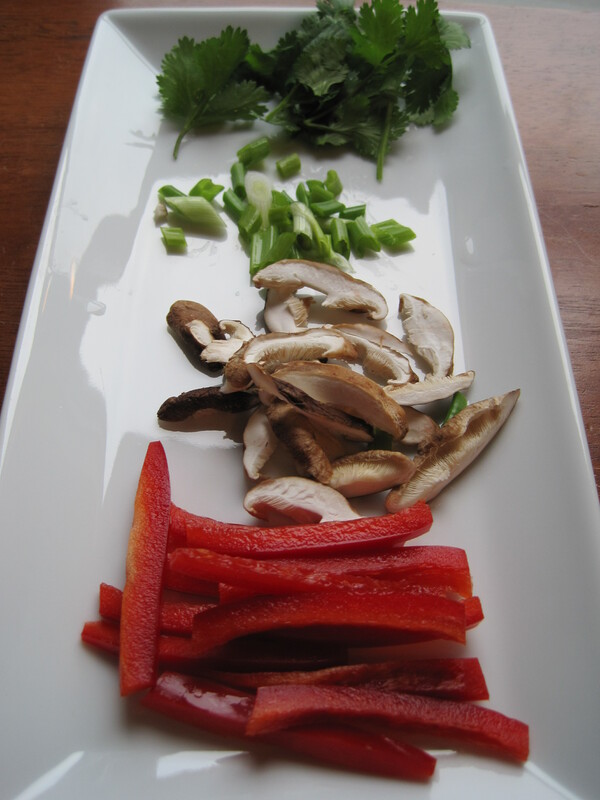 – Mushrooms sprinkled with a little olive oil, white wine, salt, pepper, and fresh thyme. Bake at 400 degrees for about 15 minutes. Serve on their own or over steak. – Flounder fillets, placed upon 2 thin lemon slices, sprinkled with parsley, salt, pepper, sautéed shallot rings, and a little butter or olive oil. Bake at 475 degrees on the top rack of your oven for about 10 minutes until cooked through. – Follow the recipe below for chicken breasts, but make up your own flavor combination by adding any of the following for a totally different taste: onions, thinly sliced carrots, thyme, rosemary, parsley, diced tomatoes, olive oil, white wine, and/or minced garlic. So what are you waiting for? In a throwback to elementary school, pull out your scissors and parchment paper and trace your Valentine heart. I promise that once you master the heart-shaped envelope, you’ll be impressed by the versatility and the healthiness of this technique. As I mentioned above, be bold when it comes to experimenting with different seasonings and ingredients. If using vegetables that require a longer cooking time (i.e. carrots), you may want to saute them briefly before adding them to the parchment paper envelope. Preheat the oven to 375 degrees and place a rack in the top third of the oven. Cut out two large rectangles of parchment paper (about 15” x 20” each) and fold each one in half. Starting from the fold, trace the outline of half a heart on each one (like you made a Valentine in school) and then cut out the heart. Repeat with the remaining rectangle. 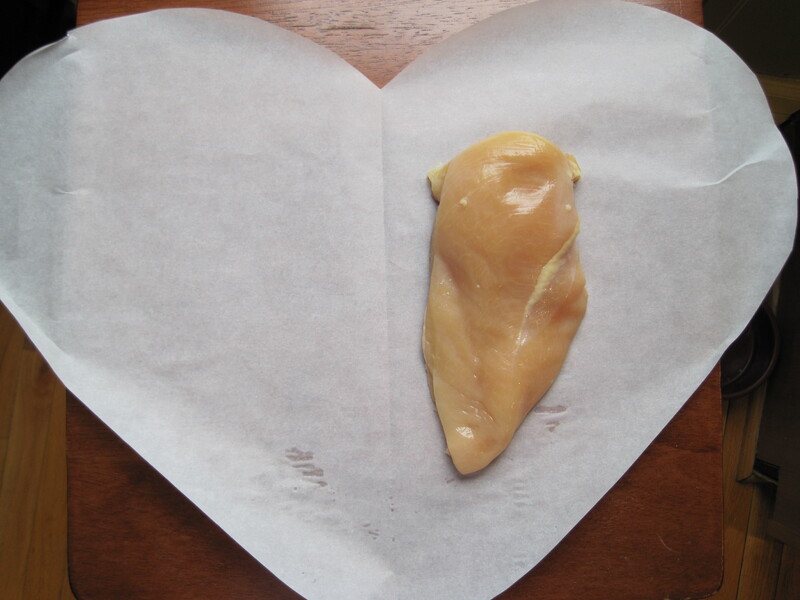 Working with one heart at a time, place a chicken breast in the center of one half of the parchment paper heart (see picture). Top the chicken breast with half of all the ingredients. Fold the parchment paper heart in half and starting at the top begin folding the edges down and sealing the heart. Make sure each fold overlaps the next by folding the next piece of the edge over the previous one and creasing it firmly. Continue moving along the outside of the heart until you have formed a package. Place the package on a baking sheet and repeat with the remaining chicken breast. Bake the parchment paper packages in the top third of the oven for about 20 minutes. Remove the packets from the oven and serve immediately. You can serve the chicken in the parchment paper envelope and have your guests cut it open at the table; or, cut open the envelope in the kitchen and slide the chicken and its toppings onto a plate to serve. Enjoy! This looks like a delicious recipe. I’ll finally have to explore that mysterious box under my stove. I’ve never heard of this cooking style but it looks fabulous. Thanks for the education! This was perfect for a post-work meal. Thanks Nikki. For people trying this recipe, go at it with a lot of heart. My hearts were too small first time around. I also ended up making a pocket with just veggies because I had extras. The vegetables cook down quite a bit and we happily added the overflow to our plates. Also, there’s plenty of juice when you open the packets, so I would serve rice instead of bread next time. Oh, and I had a cilantro-hater at the table, so substitued parsley. Great suggestions, particularly the one about needing a lot of heart! The bigger the better in this case. If the heart is too large you can definitely trim it, but it is hard to make the heart bigger! I’m a college student looking for easy meals that don’t require a ton of different obscure ingredients that I’ll never need again. This looks perfect! I’m going to try it next week! Thanks for the email and it is a perfect recipe for a college student. There are so many variations that use the same technique. If you like fish, I don’t think there’s a better way to prepare it at home. Check out my recipes for maple-soy salmon en papillote and halibut a la provencal. Both use the same technique as this chicken!